As of now, the latest model variant of the Nexus 7 is available. This is the Nexus 7 with 32GB memory. In Google Play store the Android tablet for EUR 249.00 to have. But not just because it is possible to buy the Nexus 7 for the price. Also at Media Markt to buy the newest Nexus 7, but it is not immediately available there. The Nexus 7 is indeed known to be manufactured by ASUS for Google. 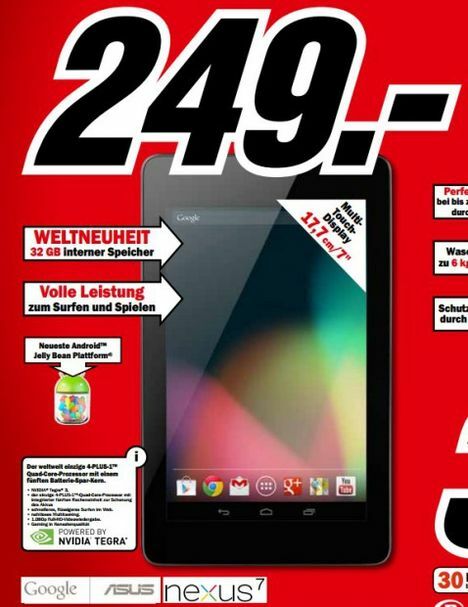 The Nexus 7 now available you get 32GB for EUR 249.00. This price you have until recently must lie down for the Nexus 7 with 16GB. These costs will now only EUR 199,00. And Google will also pay all users who have only recently purchased the tablet yet for the more expensive the price difference back . To the nexus 7 specifications I probably do not say much. As the name suggests Nexus 7, a 7-inch display with a resolution of 1,280 x 800 pixels (216ppi) is installed, plus a Tegra 3 quad-core processor (+12 GPU cores), 1GB RAM, a 1.2 MP front camera, and a battery with 4.325mAh. Of course, even NFC, Bluetooth, WiFi 802.1 1 a / b / g / n on board. On the Nexus 7 runs Android 4.1, Android 4.2 will be coming soon.